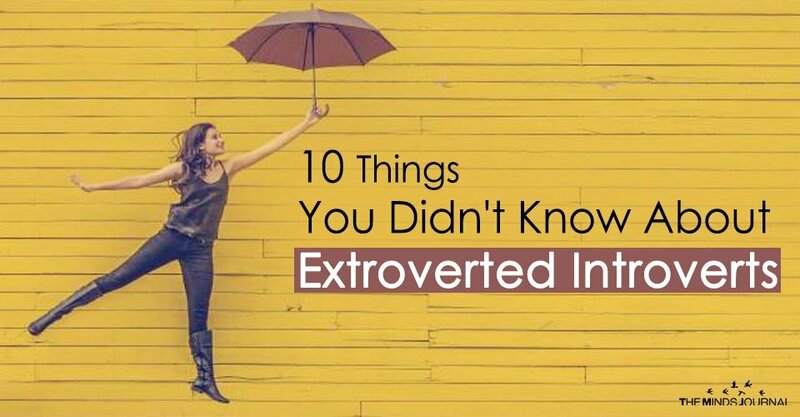 I regularly swing back and forth between social butterfly and complete hermit – which is why I was relieved to hear the phrase “extroverted introvert” for the first time. Also known as an ambivert, an extroverted introvert is someone who who exhibits qualities of both introversion and extroversion. My typical weekday exemplifies this well. Usually my mornings are spent out and about, taking sincere joy in play dates and befriending other mothers at the park. My afternoons, by contrast, are spent at home, happily curled up on the couch in my pajamas. Sometimes this is reversed, or I’ll find myself in or out for a whole day, but the half-day of each is my ideal. Small dinner parties are awesome. Night clubs are terrifying. Friendships feed my soul, but crowds drain me. Your ambivert friend may be loud and gregarious around her family, but quiet and thoughtful at the office. Seeing her in both situations may feel like meeting two entirely different people. Although an ambivert can hold up her end of a conversation, talking about the weather will not be enough to engage her. Her social energy is limited enough that she won’t want to waste it on meaningless chatter. She will likely push the conversation into deeper territory or bow out entirely. There is a big difference between the two. Choosing to sit at home with a tub of ice cream and a coloring book feels fantastic. Sitting at home because nobody called you back feels sad and lame. If you catch your friend on a highly introverted day, you may just be better off leaving him at home. He might manage to be social, but he’ll just be thinking about his books and his couch the whole time. An introverted extrovert will approach new situations with cautious excitement. If we know someone in the group, we will likely cling to them a bit as we become comfortable. If we do not, we might waver on the edge of the crowd, slowly getting used to the water rather than jumping in all at once. We don’t mean to be snobs. We just have limited social energy and prefer interacting one-on-one or in small groups. For this reason, we can only afford to invest our social time and energy in those who we feel truly connected to. We like talking to people, but we value our alone-time, as well. This can make maintaining a friendship tricky. If your ambivert friend makes an effort to consistently invest time and energy in your friendship, be glad. You are truly special to him. My alone time is so special to me. I connect with all … especially the trees … they connect with the universe in me.